Hello crafty friends, and welcome back! 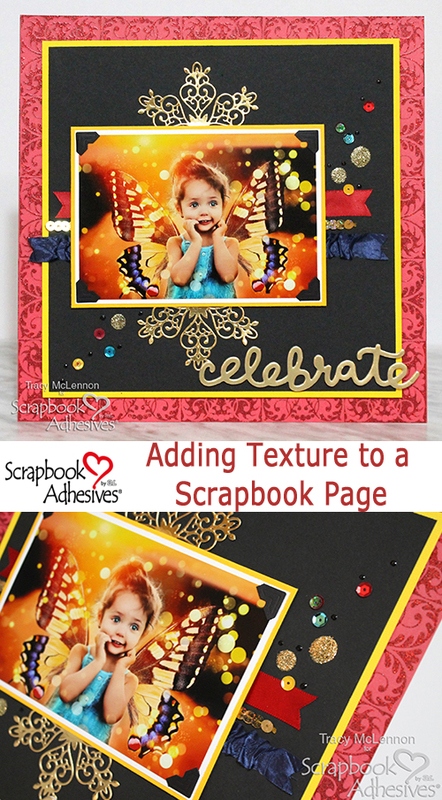 Tracy here, and today I have a fun, texture-filled “Celebrate” scrapbook layout to show. 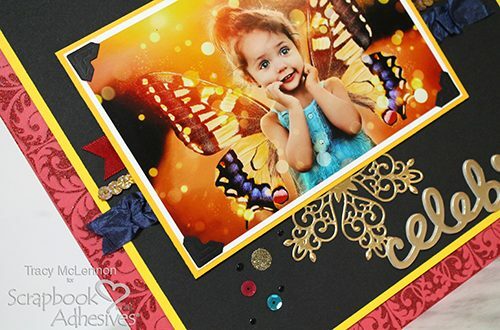 Using my favourite adhesives, I’m sharing all of these different texture making ideas. So join me for all the details. First, start by creating a layered background. The red patterned paper has glittered accents so I opted for the E-Z Runner® Grand Refillable Dispenser with the E-Z Runner® Grand Ultra Strong Refill to make sure the layers stayed in place. It is so easy to change out the refill cartridges, see below for a quick How to Use and Refill E-Z Runner® Grand Dispensers video. Second, I used this same adhesive for my matted photo and then added Creative Photo Corners Black on the photo itself. Set the matted photo aside. Using Extreme Double Sided Tape 1/8in I placed strips across the middle of the layout. Then using the blue silk ribbon, I ruffled it across the bottom strip of adhesive. The next strip I added sequins trim, and to the top strip, I added red satin ribbon. Adhere the matted photo over top of the ribbon strips using Crafty Foam Tape Black. 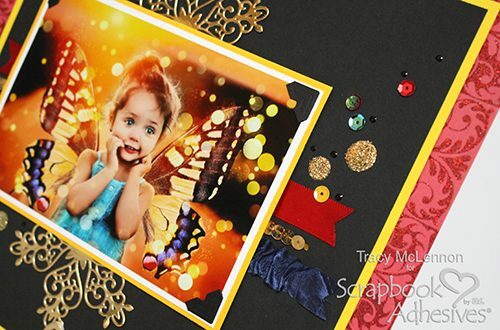 Cut a piece of gold foil paper to 4×6 and adhere it to an Adhesive Sheets 4×6 inch. Next using the decorative die I ran the foiled paper with the adhesive through my die cutting machine. I snipped the decorative piece in half and adhered a half above and below the matted photo. View this quick How to Use Adhesive Sheets for Die Cutting video below. Next, using Adhesive Dots Large and Adhesive Dots Medium, I added a few dots diagonally across the layout, then added gold glitter to them. Using Adhesive Dots Mini I added sequins diagonally across the layout too. Then finally I added some Nuvo Dots to the same area. 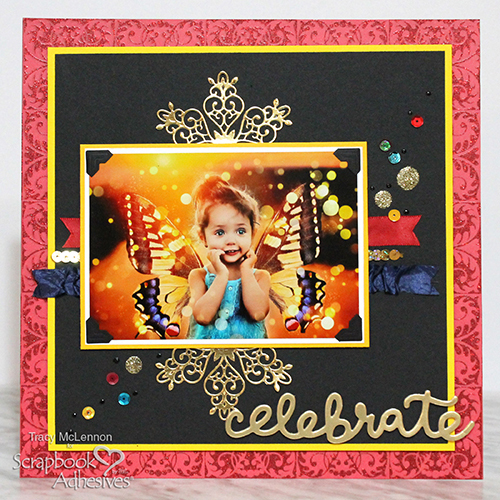 Add the foam “celebrate” sticker in the bottom right-hand corner. This entry was posted in Adhesive Dots & Lines, Adhesive Sheets, Adhesives, Crafts & Tutorials, Crafty Foam Tape, Creative Photo Corners, E-Z Runner® Grand, Extreme Double-Sided Tapes, HomeHobby by 3L, Intermediate, Permanent Adhesive, Scrapbook Page, Scrapbooking, Skill Level, Wear your Adhesive on the Outside and tagged Adhesive Dots Large, Adhesive Dots Medium, Adhesive Dots Mini, Adhesive Sheets 4x6", Crafty Foam Tape Black, Creative Photo Corners Black, Creative Photo Corners Mix Pack, E-Z Runner Grand Dispenser, E-Z Runner Grand Ultra Strong Refill, Extreme Double-Sided Tape 1/8", Glitter, HomeHobby by 3L, Scrapbook Page, Scrapbooking, Tracy McLennon, Wear Your Adhesive on the Outside. Bookmark the permalink.